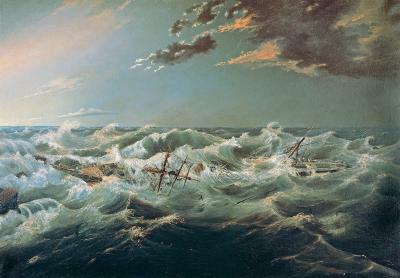 The wreck of the SS Admella in the early hours of August 6th 1859 was only the beginning of a horrific week for survivors who remained on board, in sight of land, while authorities struggled to rescue them from the stricken steamer. The loss of 89 lives, mostly due to cold and exposure, makes the wreck one of the worst maritime disasters in Australian history. It was the first major rescue incident that involved the cooperation of a large number of organisations and individuals across the newly formed colonies of Victoria and South Australia. In many ways it was the basis of joining together these isolated communities into a regional group, and was the beginning of many ongoing organizations across the south east of Australia. 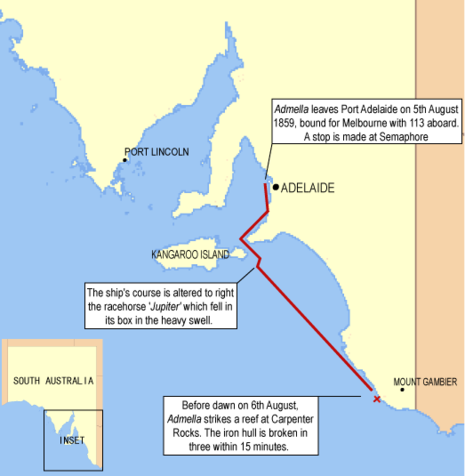 The Admella was sailing from Adelaide to Melbourne when it struck Carpenters Reef on the Southern Coastline of South Australia. A design fault in its iron hull caused the ship to break into three after only 15 minutes, leaving passengers and crew clinging to the wreckage with minimal water and food. 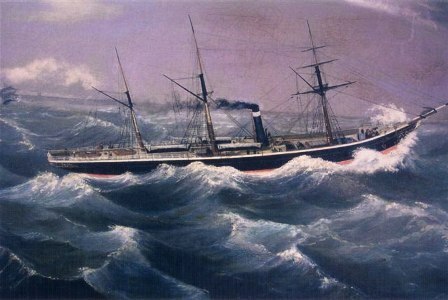 On Wednesday 10th it was reported that the Corio was beside the wreck and that around 20 survivors were still on board. Those on shore lit fires to help the vessel stay near the wreck site. Over the next few days several rescue attempts by the Corio and Ladybird were made. Rockets were fired to try to get lines aboard but mountainous seas and severe storms continually drove the rescuers back and lives were lost as the lifeboats were swamped. A further attempt was made to launch one of Admella's own lifeboats, which had washed ashore, but it too was unsuccessful. By Saturday, one full week after the wreck, the Admella's lifeboat and the Corio's boat were launched from the beach and managed to crash through the surf and reach the wreck. Eventually three people made it onto one boat which then capsized, drowning one man. The remaining nineteen were moved onto the Portland lifeboat arriving in port on August 13th. A surge of relief swept the country when it was known that the handful of survivors were safe and recovering quickly. For a few weeks crews who had participated in the rescue were treated as heroes, especially Captain Greig and the crew of the Lady Bird. When things had quietened down the committees appointed in Melbourne, Adelaide and Portland to handle relief money spent their funds on monetary awards, medals, the publishing of a book dealing with the wreck and a donation to the Sailors' Home. In Adelaide the committee used its money for monetary awards while those in Portland used the funds to pay accounts for lodging and for clothing the survivors; also doctors' bills and other sundries associated with their care once they were landed at Portland. The medals were eventually presented by the Governor at a function in the Exhibition Building, Melbourne, on 25 June, 1860.